Popular in Italy but also grown in the United States, rapini (or broccoli raab) is a turnip-like vegetable that’s featured in the recipes of cable television’s top celebrity chefs. But foodies are not the only fans of rapini. Honey bees love it too—or more precisely, they love rapini’s bright-yellow, pollen-packed flowers. • Identification of 20 amino acids in rapini pollen, including higher concentrations of cysteine and proline, which are building blocks of antimicrobial peptides in bees. • More than twice as many Nosema spores in supplement-fed colonies than in those that foraged rapini pollen. 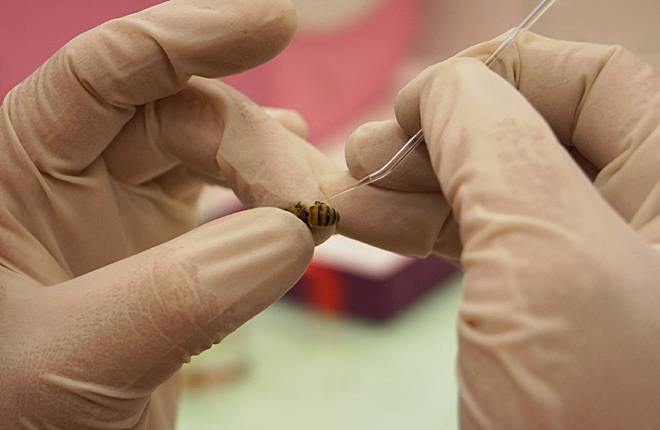 There were also higher levels of black queen cell virus. • The higher levels of Nosema also correlated strongly with the lower protein digestion observed in supplement-fed colonies. • Computer modeling simulations indicate that bees from rapini-nourished colonies can do a better job pollinating almond flowers than those from supplement-fed colonies—with profits of $3,784 per acre versus $2,487 an acre, in one case. 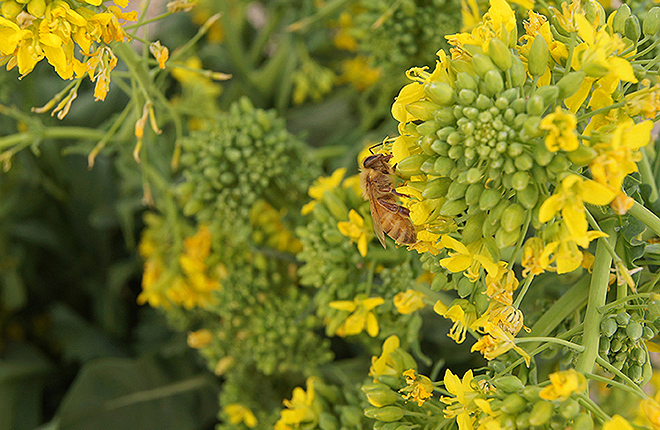 “Bees Abuzz Over Rapini” was published in the February 2016 issue of AgResearch Magazine. Bee colonies are transported in the fall to California to pollinate almonds in February. During the winter, the bees are usually fed protein supplements. Rapini is a plant that begins flowering 6 weeks after planting. Colonies that foraged rapini pollen fared better than those fed supplements.